Shaolin spearplay there are eight female, six wonderful, Friday, sanqi. Shaolin spearplay eight: sealed, closed, the mother, away, stop, take, also, wrapped. 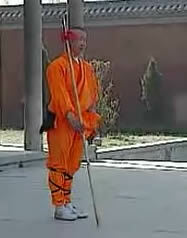 The eight mother are the eight basic marksmanship in Shaolin marksmanship. Although the number of attack and defense category was changing, but cannot do without the eight female gun, the method which, it is called the. ? Six seconds: A, two, five, four, three arbitrary oblique, six straight. ? six wonderful is the six on the gun attack tactics and combat know-how, marksmanship with. Fifth: a circle, two string, three row, four, five bar pressure. ?